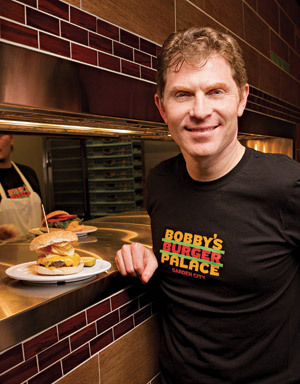 Bobby Flay, proprietor and Executive Chef of 13 restaurants, including Bar Americain (NYC and Uncasville, CT) and Bobby Flay Steak (Atlantic City, NJ), has hosted culinary television programs, authored cookbooks and portrayed a fictional version of himself on Entourage. He is also an amateur cage fighter. 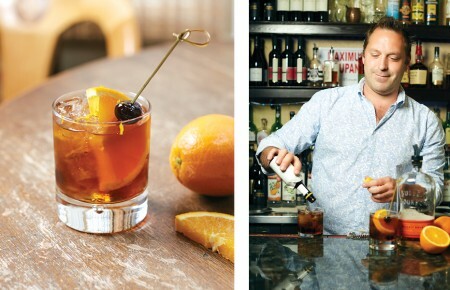 Bobby Flay: Like, Bobby Flay as food? NK: Yeah. Would you be Bobby Soufflé? BF: [Laughs] I would be a big plate of nachos, probably, because, you know, there’s a lot goin’ on, with a lot of texture. NK: Bobby Nachos. I like that. 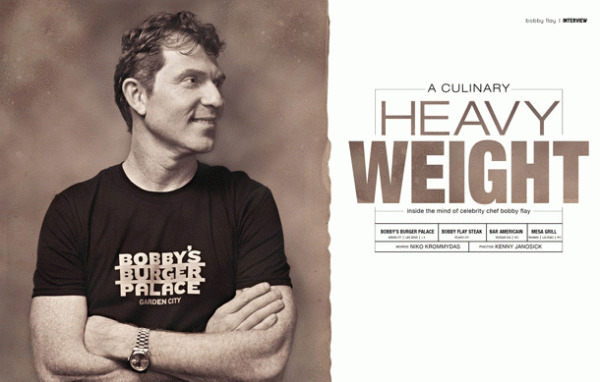 The menu for Bobby’s Burger Palace features region-based burgers across America, such as the Napa Valley Burger, with fresh goat cheese and watercress. What would a burger from Long Island comprise? BF: Good question. Some people have been asking for a Long Island-based burger, but I haven’t come up with anything yet. I think it would have tomatoes, corn and probably some sweet onions. Maybe cooked relish, too. I want to feature Long Island in our Burger of the Month series, probably in August or September, when the produce is best here. I think it would be cool to have a burger that showcases the farms on Long Island. NK: I also noticed that every Bobby’s Burger Palace features one craft beer from that area. BF: Yeah. 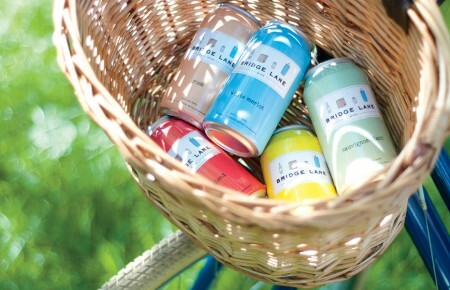 We have Blue Point Brewing Company in Roosevelt Field. NK: How important is serving local food and beverages, instead of, say, imported? BF: It’s important to focus on local ingredients because, from the farmers who cultivate it, to the customers who consume it fresh, everyone wins. Food is also a great observational tool and it can teach you a lot about culture. I think of my restaurants as separate entities, not chains, and people appreciate that. For example, when we opened Bobby’s Burger Palace in Roosevelt Field, our second on Long Island, we had a ribbon-cutting ceremony with [Town of Hempstead] Supervisor Kate Murray. We felt amongst the community. NK: You’ve had several television series and you recently appeared on Entourage. How did the chef become a celebrity? NK: Is it good exposure? BF: Yeah. It’s a great thing, and not just for me, personally, for this country. We’re finally catching up with the rest of the world and putting importance into food. Not just the flavor of things and how it enhances culture, but also, we’re trying to defeat diabetes and obesity in this country, and it all begins with what we eat. Knowledge is power and people are being informed. NK: Will the education continue? Where do you see food in 2012? BF: I think we’re moving up and taking concepts that, over the last twenty years have been relegated to processed and fried, and putting it back into the kitchen. I doubt the first McDonald’s was how it is now. They probably had a decent burger. NK: Speaking of McDonald’s, I’m sure you’ve tried some weird stuff. What was the apex? BF: Monkfish intestines. I had them in Japan. BF: Not at all. The taste was incredibly acidic and just really strong-flavored. And I like strong flavors, too. But that was way too much. NK: Back to Entourage. Did you really hook up with Ari’s wife? BF: [Laughs] No. No hook-up. BF: I know. Ari got her back in the end. We were just trying to teach him a lesson. NK: Who is winning a steel cage match between you and Masaharu Morimoto? BF: [Laughs] It’s in a steel cage? I bet Morimoto would be tough in a steel cage, because he’s pretty crafty. He would probably beat me, but I would die trying. As long as there are no knives hanging around, I have a legitimate shot.